Mature couples don’t “fall in love,” they step into it. Love isn’t something you fall for; it’s something you rise for! It takes two to make a romantic relationship work. In a mature relationship both the partners trust and love each other. They don’t suffer from insecurities. This helps them to be more practical and understand both of them have careers as well as other people in their lives who also have some right over their time and attention. While a couple in a mature relationship enjoys being together, they also allow space so that each of them can be in the sync with their surroundings, meet their duties and have a healthy social life. Do you feel the need or pressure to agree on everything your partner says or believes in? If you are doing this you are in an immature relationship which will soon get you bored and suffocated. A healthy and mature relationship has two people who accept each other as two different individuals. Such a relationship has the maturity to understand and appreciate each view point. When you are involved with a person who has a good heart, they will just let you be. They will never force you to change, never criticize you harshly or bring down your confidence. In a mature relationship both the partners learn from each other and improve. They get rid of their faults and build a world which is a source of constant happiness. Anybody who comes in touch with them is bound to feel the positive vibes. Everyone has something which may be considered quite odd by the others. Some people burp aloud, some people snore, some people have strange eating habits, etc. 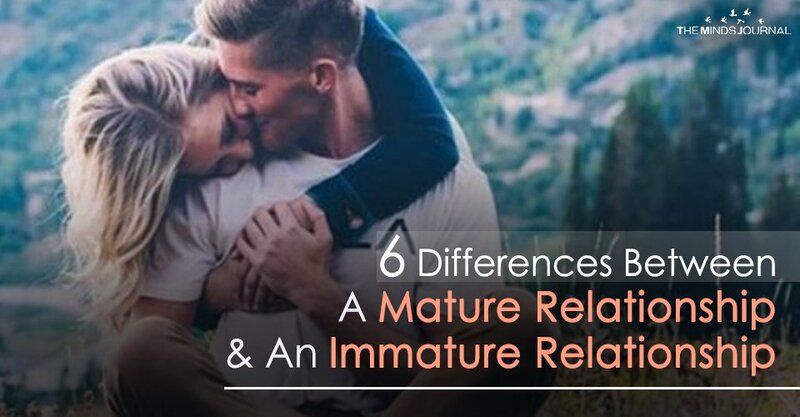 If you are in a mature relationship, you will not be rebuked for your quirks. At the same time, you would also not feel humiliated if your partners suggests you a solution for a problem like snoring or shows a better way of doing things. As you move ahead in the relationship, you realize your partner is indispensable part of all your future plans. You want them around in every second of your life and any thought of their absence scares you to death. Their presence makes everything complete and joyous. Physical Intimacy is the most intimate and beautiful thing in a relationship, and couples in mature relationships never shy away from discussing their needs, desires and wants related to it. They discuss their deepest fantasies, insecurities and how they can work together to make their physical life better and satisfying while giving respect to each other’s like and dislikes.